- Mid-South Superdome Extravaganza (April 7, '84) = The Rock-n-Roll Express (Gibson & Ricky Morton) defeated Nikolai Volkoff & the Russian Invader. - Mid-South Superdome Extravaganza (June 16, '84) = The Rock-n-Roll Express lost a "No Disqualification" Match to the Mid-South Tag Champs, the Midnight Express (Eaton & Condrey). - Mid-South Superdome Extravaganza (November 22, '84) = The Rock-n-Roll Express stayed the Mid-South Tag Champs, winning a "Scaffold" Match over the Midnight Express (Eaton & Condrey). - Mid-South Superdome Extravaganza (March 30, '85) = The Rock-n-Roll Express won a "Four Corners" Match over the Road Warriors, the Freebirds, & the Dirty White Boys. - Mid-South Superdome Extravaganza (June 1, '85) = The Rock-n-Roll Express lost to the Mid-South Tag Champs, Ted DiBiase & Steve Williams. 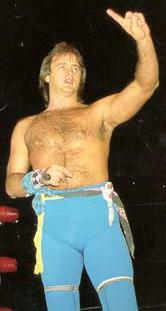 - NWA Starrcade '85 (November 28) = The Rock-n-Roll Express won the NWA World Tag Titles, beating Ivan & Nikita Koloff. - NWA/AWA Star Wars (December 29, '85) = The Rock-n-Roll Express took down Bill & Scott Irwin. - NWA/AWA Star Wars (February 24, '86) = The Rock-n-Roll Express won, via DQ, over the NWA Tag Champs, the Midnight Express (Condrey & Eaton). - NWA 1st Annual Jim Crockett,Sr. Memorial Tag Team Tournament Cup (April 19, '86) = The Rock-n-Roll Express lost to the Sheepherders. The Road Warriors won the tournament. - Mid-South Superdome Extravaganza (June 14, '86) = Gibson beat Baron von Raschke. - NWA Great American Bash '86 (July 5) = Gibson pinned Black Bart. - NWA Great American Bash '86 (July 26) = The Rock-n-Roll Express fought to a Draw with Ole & Arn Anderson. - NWA Central States Heavyweight Title Tournament (November 16, '86) = Gibson lost in the first round to Bill Dundee. Sam Houston won the tournament. - NWA Starrcade '86 (November 27, '86) = The Rock-n-Roll Express retained the NWA Tag Titles, winning a "Steel Cage" Match over Ole & Arn Anderson. - Mid-South Superdome Extravaganza (June 13, '87) = The Rock-n-Roll Express retained the NWA World Tag Titles, beating Vladimir Petrov & the Angel of Death. - NWA Great American Bash '87 (July 4) = The Rock-n-Roll Express retained the NWA World Tag Titles, winning, via DQ, over the Midnight Express (Eaton & Lane). 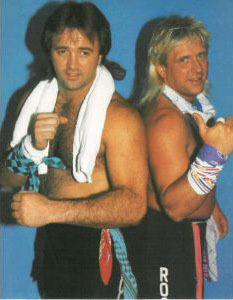 - NWA Great American Bash '87 (July 18) = The Rock-n-Roll Express stayed the NWA Tag Champs, beating the MOD Squad. - NWA Great American Bash '87 (July 31) = The Rock-n-Roll Express kept the NWA World Tag-Team Titles, winning, via DQ, over the Midnight Express (Eaton & Lane). - NWA Starrcade '87 (November 26) = The Rock-n-Roll Express won a "Scaffold" Match over the Midnight Express (Eaton & Lane). - AWA Rage In A Cage II (April 16, '88) = The Rock-n-Roll Express fought to a Double Disqualification with the Nasty Boys. - AWA SuperClash III (December 13, '88) = The Rock-n-Roll Express fought to a Double-Countout with Jimmy Golden & Robert Fuller. - NWA United States Tag Team Title Tournament (January/February '90) = The Rock-n-Roll Express lost in the first round to the Midnight Express (Eaton & Lane). Brian Pillman & Tom Zenk won the tournament. - NWA WrestleWar '90 (February 25) = The Rock-n-Roll Express beat the Midnight Express (Eaton & Lane). - NWA Capital Combat (May 19, '90) = The Rock-n-Roll Express won a "Corporal Punishment" Match over the Freebirds. - NWA Clash of the Champions XI (June 13, '90) = The Rock-n-Roll Express won, via DQ, over the NWA United States Tag Champs, the Midnight Express (Eaton & Lane). - NWA Great American Bash '90 (July 7) = The Rock-n-Roll Express lost to the NWA World Tag Champions, Doom. - WCW Great American Bash '91 (July 14) = Gibson was taken down by Ricky Morton. - SMW Volunteer Slam (May 22, '92) = Gibson pinned Jimmy Golden, then later lost to Paul Orndorff in the SMW Heavyweight Title Tournament. Brian Lee won the tournament. - SMW Summer Blast '92 (July 17) = Gibson lost, via DQ, to Jimmy Golden. - SMW Fire On The Mountain '92 (August 8) = The Rock-n-Roll Express defeated Jimmy Golden & Robert Fuller. - SMW Thanksgiving Thunder '92 (November 26) = The Rock-n-Roll Express lost the SMW Tag Titles, losing a "Falls Count Anywhere" Match to the Heavenly Bodies (Lane & Pritchard). - SMW Thanksgiving Thunder '92 (November 27) = The Rock-n-Roll Express won back the SMW Tag Titles, winning a "Texas Death" Match over the Heavenly Bodies. - SMW Thanksgiving Thunder '92 (November 28) = The Rock-n-Roll Express dropped the SMW Tag Titles back to the Heavenly Bodies in a "Street Fight" Match. - SMW Thanksgiving Thunder '92 (November 29) = The Rock-n-Roll Express regained the SMW Tag-Team Titles, winning a "Steel Cage" Match over the Heavenly Bodies. - WCW Superbrawl III (February 21, '93) = The Rock-n-Roll Express won, via DQ, over the SMW Tag Champs, the Heavenly Bodies (Lane & Pritchard). - SMW Bluegrass Brawl (April 2, '93) = The Rock-n-Roll Express & Arn Anderson lost a "Six-Man Three-Way Street Fight" Match to the Heavenly Bodies (Eaton, Lane, & Pritchard). Jimmy Golden, Robert Fuller, & Dutch Mantel were the other participants. - SMW Volunteer Slam II (May 9, '93) = The Rock-n-Roll Express, Jimmy Golden, Robert Fuller, & Brian Lee won a "Rage In A Cage" Match over Killer Kyle, Kevin Sullivan, the Tasmaniac, & the Heavenly Bodies (Lane & Pritchard). - SMW Last Tango In Tennessee (May 15, '93) = The Rock-n-Roll Express won the SMW Tag Titles, winning a "Loser of Fall Leaves Town" Match over the Heavenly Bodies (Lane & Pritchard). Lane lost the fall. - SMW Hot August Night in Mo-Town (August 13, '93) = The Rock-n-Roll Express lost a "No Disqualification" Match to the SMW Tag-Team Champions, the Bruise Brothers. - SMW Fire On The Mountain '93 (August 14, '93) = The Rock-n-Roll Express, Bob, Steve, & Scott Armstrong won a "Rage In A Cage" match over the Heavenly Bodies, the Bruise Brothers, & Jim Cornette. - SMW K-Town Showdown (August 20, '93) = The Rock-n-Roll Express lost a "Four Corners Tag-Team" Match to the Bruise Brothers. The Heavenly Bodies and Scott & Steve Armstrong were the other participants. - SMW Big Apple Grapple (October 1, '93) = The Rock-n-Roll Express stayed the SMW Tag-Team Champions, beating the Heavenly Bodies (Pritchard & Del Ray). - WWF Survivor Series '93 (November 24) = The Rock-n-Roll Express lost the SMW Tag Titles to the Heavenly Bodies (Prichard & Del Ray). - SMW Thanksgiving Thunder '93 (November 25) = The Rock-n-Roll Express fought to a No-Contest with Moondogs Rex & Spot. - SMW Sunday Bloody Sunday (February 13, '94) = The Rock-n-Roll Express won, via DQ, over the SMW Tag-Team Champions, the Heavenly Bodies. - SMW Bluegrass Brawl II (April 1, '94) = The Rock-n-Roll Express won a "Loser Leaves Town Steel Cage" Match over the Heavenly Bodies (Pritchard & Del Ray). - SMW Volunteer Slam III (May 20, '94) = The Rock-n-Roll Express lost a "No Disqualification No Time Limit" Match to the SMW Tag Champs, Chris Candido & Brian Lee. - SMW Night of Legends (August 5, '94) = The Rock-n-Roll Express won the SMW Tag-Team Titles from Chris Candido & Brian Lee. - SMW Fire On The Mountain '94 (August 6) = The Rock-n-Roll Express lost the SMW Tag Titles, losing a "Hair vs. Hair" match to Chris Candido & Brian Lee. - SMW Big Apple Brawl (September 30, '94) = The Rock-n-Roll Express, Tracey Smothers, & the Dirty White Boy won a "Rage In A Cage" Match over Boo Bradley, Bruiser Bedlam, & the Gangstas. - SMW Brawl In The Hall (February 25, '95) = The Rock-n-Roll Express retained the SMW Tag Titles, winning, via DQ, over Al Snow & the Unabom. - SMW Sunday Bloody Sunday II (February 26, '95) = The Rock-n-Roll Express again kept the SMW Tag Titles by winning, via DQ, over Al Snow & the Unabom. - SMW Bluegrass Brawl III (April 7, '95) = The Rock-n-Roll Express lost the SMW Tag-Team Titles, losing a "Coal Miner's Glove On A Pole" Match to Al Snow & the Unabom. - SMW Fright Night (April 8, '95) = Gibson fought to a Draw with Al Snow. - SMW Volunteer Slam IV (May 19, '95) = Gibson won a "Falls Count Anywhere" Match over the Unabom. - SMW Charlotte Memories (May 20, '95) = The Rock-n-Roll Express lost a "Steel Cage" Match to Al Snow & the Unabom. - SMW Summer Blast '95 (July 15) = The Rock-n-Roll Express won a "Street Fight" Match over Al Snow & the Unabom. - SMW Fire On The Mountain '95 (August 12) = Gibson won a "Handicap Loser Wears A Dress" Match over the Headbangers. - SMW Carolina Cup Tag Team Tournament (August 13, '95) = Gibson & Curtis Thompson lost in the first round to the Headbangers. Tracey Smothers & the Dirty White Boy won the tournament. - SMW Halloween Scream '95 (October 20) = Gibson won, via DQ, over the Punisher. - SMW Halloween Scream '95 (October 21) = Gibson defeated the Punisher. - SMW Halloween Scream '95 (October 26) = Gibson again won, via DQ, over the Punisher. - SMW Thanksgiving Thunder '95 (November 23) = Gibson & the Heavenly Bodies won, via DQ, over Ricky Morton, Tracey Smothers, & the Dirty White Boy. - SMW Thanksgiving Thunder '95 (November 25) = Gibson & the Heavenly Bodies fought to a Double Disqualification with Ricky Morton, Tracey Smothers, & the Dirty White Boy. - FMW 7th Anniversary Show (May 5, '96) = The Rock-n-Roll Express & Ricky Fuji beat Crypt Keeper, Freddy Krueger, & the Boogie Man. - WCW Bash At The Beach '96 (July 7) = In a dark match, the Rock-n-Roll Express defeated Scott Norton & Ice Train. - WWF Wrestlemania XIV (march 29, '98) = The Rock-n-Roll Express competed in a "Tag-Team Battle Royal", which was won by the Legion of Doom 2000. - WWF Unforgiven '98 (April 26) = The Rock-n-Roll Express lost to the NWA World Tag Champs, Bob Holly & Bart Gunn. - PPW Tag-Team Title Tournament (July 21, '98) = The Rock-n-Roll Express beat Tony Falk & Master B and Tracey Smothers & Tom Pritchard before losing in the finals to Billy Joe Travis & Bulldog Raines. - Mid-South Clash of the Legends (June 15, '01) = Gibson & Bill Dundee defeated the Galaxians. - Mid-South New Generation Wrestling (July 26, '02) = The Rock-n-Roll Express beat Buddy Landel & Jamie Dundee. - NWA-TNA PPV (Show #29, January 29, '03) = The Rock-n-Roll Express took down America's Most Wanted. - NWA-TNA PPV (Show #31, February 12, '03) = The Rock-n-Roll Express were beaten by America's Most Wanted. - Mid-South A Fight For A King (November 29, '03) = The Rock-n-Roll Express won a "Concession Stand Tag-Team Battle Royal". This was the match where Moondog Spot collapsed and later passed away. - Mid-South Throwback Night (July 10, '04) = Gibson & Todd Morton fell to Jerry Lawler & Brian Christopher. - Mid-South Throwback Night III (October 30, '04) = The Rock-n-Roll Express & Jerry Lawler were beaten by Corey Maclin, Jackie Fargo, & Stan Lane. - OVW Summer Sizzler Series '07 (August 10) = Team Snow (Gibson, Colt Cabana, Atlas Da Bone, Chet the Jett, & Al Snow) won a "Capture The Flag Wargames" Match over Team America (Vladimir Kozlov, Mike Kruel, the Belgian Brawler, & Los Locos). - IWC Night of Legends '11 (April 16) = The Rock-n-Roll Express defeated The Midnight Express.